Live Roulette is a relatively new concept in online casino games in an attempt to bring the feel of land based gaming to your laptop. 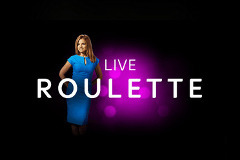 Live roulette uses real dealers, real roulette wheels and real balls to generate the winning number in real time. Although a little strange at first, you may find you enjoy live roulette more than regular computer controlled roulette after a while, this will be due to a more personal feel. In fact the only real difference between live roulette and land based casino roulette is the way the chips are placed. The dealers have it easy here as there are no chips to tidy up or clear, this is the only computer controlled element and is done from your laptop or tablet. Live roulette is mostly dealt by attractive females, although you may find male dealers in some online casinos. Often it is also possible to chat to the dealers, and occasionally other players, but again this depends on your playing location. Don't worry about combing your hair, the viewing is strictly one way so they can't see you. You bet in the same way as you would in regular roulette, with the odds, betting patterns etc. all been the same, you will find however that live roulette plays a little slower, which many players will enjoy. The majority of online casinos now offer live roulette, with their dealers often stationed in small studios rather than real casinos. Although mostly enjoyed on desktops, laptops or tablets, online casinos are starting to offer live roulette for mobiles, however the small screen takes away the personal touch of a real person spinning the wheel, it is however a fun concept that should be tried at least a couple of times if you are a fan of roulette games.